Six episodes of the Storm-Hunters TV show that I sometimes co-host are now available on Amazon Prime Video. The program is produced by The Weather Network in Canada, but now, thanks to the streaming service, it is available in the U.S. Canada and the U.K. To watch, head over to the Prime Video site and search for the show. (Amazon Prime Subscription required). The #1 most watched program on Science Channel - This program looks at mysterious and odd satellite images of Earth, and investigates what they could possibly be. I have appeared on-camera in 5 seasons of the show, providing insight into some of the stories covered. 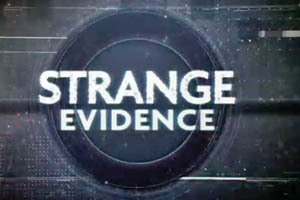 I appear in two seasons of the Discovery Science Channel program "Strange Evidence" which showcases unusual, rare, or odd videos from cell phones, dash-cams, and surveillance systems. These videos are analyzed by experts to break down and try to explain exactly what's going on. The first three seasons of the TV series I hosted, Angry Planet, is now available to stream on Amazon Prime Video. 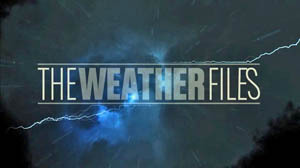 The Weather Files tells the stories of people who work in extreme weather and the storms they will never forget. Plus, experts tell us the how and why behind the worlds worst weather. 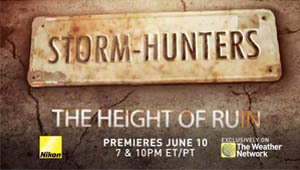 Stormhunters - Height Of Ruin: This episode focuses on the recovery efforts in the wake of the massive earthquake in 2015 that killed 9000 people and crippled the nation. We travel from Kathmandu to the smaller villages in the hills to see how recovery is progressing in both urban and rural areas. The episode will eventually be available online here. 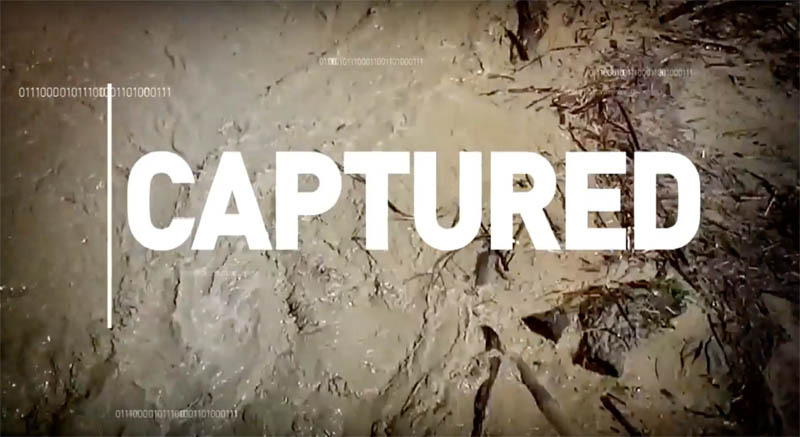 A new season of "Captured" is airing on Sunday nights on The Weather Network in Canada. The program, hosted by Michelle Mackey showcases viral weather videos and brings experts on to analyze them and explain exactly what's going on in the video. 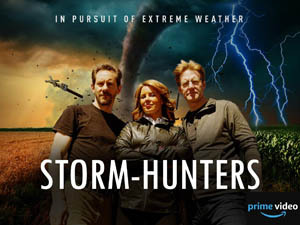 I'm pleased to announce that new episodes of Stormhunters have been released. They've been airing on The Weather Network, but you can watch them online too. I make appearances in four out of the five new episodes which include: chasing hurricane Matthew in Florida, a journey to Mount Washington in New Hampshire and two episodes featuring a descent to the bottom of Marum crater on the Ambrym Island volcano in Vanuatu. 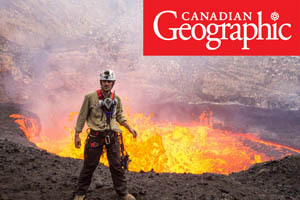 Discovery Channel Canada's flagship daily science/tech news show, Daily Planet is featuring a story on our expedition to the Nyiragongo lava lake in eastern Congo from last year. Depending on where you live, you might be able to watch the segment here. Just go to the Jan 31st episode. Angry Planet - Angry Planet features my efforts to travel the world, documenting the most extreme forces of nature. 49 episodes, full of action-packed, worldwide adventure were made. The first 3 seasons were made for OLN in Canada, and season 4 for Pivot TV in the U.S. Episodes can still be seen in Canada on The Weather Network. Filming locations for season four included: The Brazilian Amazon, Cape Verde Islands off the west coast of Africa, Australia, Vanuatu, the tiny island nation of Tuvalu, Siberia, Laos, Newfoundland, Manitoba and Bangladesh. Season 4 didn't just focus on extremes of nature, but also took a closer look at climate change and the effects of human activity on our atmosphere and environment. Discovery Channel Canada's flagship show Daily Planet did a 2016 year in sci-tech special episode. Included in that program was a segment on exploration. Featured in that was my 2016 expedition to go down to the bottom of Nyiragongo volcano in eastern Congo. Meteorologists and storm chasers are interviewed about interesting and spectacular viral videos involving the weather and other natural forces. 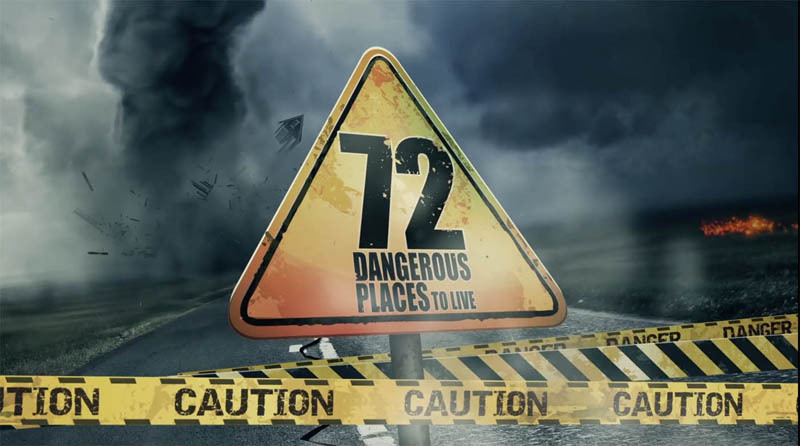 I'm featured in on-camera interviews in the six-part series "72 Dangerous Places to Live" for National Geographic Channel. Also, my footage from around the world was used. The series can also be found on Netflix. I was invited by Burger King to assist them with a plan to descend down inside the Pacaya volcano in Guatemala (We believe a world's first), ignite a lantern flame from the lava inside, then hand the fire off to a group of contest winners who then took the eternal flame on a road trip through Central & South America to Sao Paulo, Brazil. Once there, I met up with them again and used the flame to symbolically light the grill for their new "Angriest Whopper". 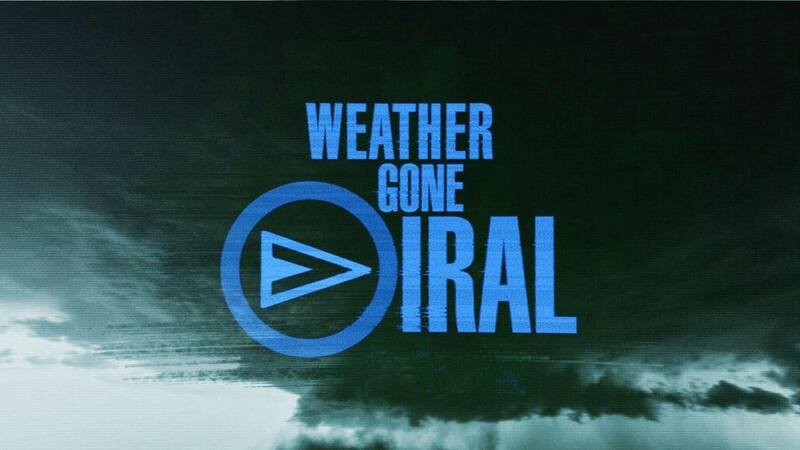 "Weather Gone Viral" showcases some of the internet's most popular and viral videos that include wild weather. The program airs on The Weather Channel in the U.S. and features some of my footage. 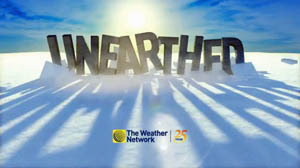 The TV series, "Strangest Weather on Earth" is now airing on the U.S. Weather Channel. I was interviewed on-camera for all 3 seasons of the show which showcases some of the most bizarre, rare and unusual weather events ever documented. It was a great privilege to have been asked by Pivot TV to host their special week of programming that commemorated the 10 year anniversary of hurricane Katrina. My parts, which were filmed in New Orleans, were shown all week, introducing the various programs etc. Each show focused on the effects the hurricane had, including the economic and social impacts. We also looked ahead into what future, looking at what effect the next hurricanes might have on the Gulf Coast. Look for some of my volcano footage in the new series "3 Scientists Walk Into a Bar" on The Weather Channel. Die Trying "Crater of Fire" - National Geographic Channel - The National Geographic show featuring the expedition that I led for them to the Darvaza flaming gas crater in Turkmenistan. The Darvaza crater is an old natural gas drilling site that collapsed, causing a pit, leaking methane gas. It was lit on fire and has been burning for several decades. No one has ever attempted to go inside before. My mission was to gather samples from the crater floor, then have them analyzed, looking for extremophile bacteria that might be thriving in the hot, methane rich environment. Angry Planet - My storm chasing/extreme exploration television series. Has aired around the world on OLN, The Weather Network, The Travel Channel, Pivot TV, and numerous other networks in over 100 countries. A full listing can be found here. 4 seasons have been produced totalling 49 episodes, filmed in over 35 countries on all 7 continents. Unearthed - The Weather Network - Multi-part series filmed in Arctic Canada, Greenland & Antarctica. The series showcases extreme, remote environments and climate. The premiere was April 6th, 2014. National Geographic Channel (UK) - Worst Weather Ever? - On camera interview as part of this special show on weather & climate. We filmed it in New York City, where I was during hurricane Sandy. Another new show for The Weather Channel. This one features an interview with me and some video clips. The new episode of Weather Caught On Camera has a segment where I talk about our tornado encounter in Kansas from May 22nd, 2008. It was my 38th birthday and we (Cloud 9 Tours) were chasing a tornado producing storm that got very, very close to our location. SKY News, U.K. - Live Skype interview about Cyclone Phailin making landfall in India. Some of my Hurricane Sandy footage is being used by the National Science Foundation for an online video series entitled Science Nation. I was a guest on the Lang & O'Leary Exchange, chatting about my adventures and climate change. The show airs on CBC television and CBC News Channel. Aug/Sept. 2005 - Live call ins before & interview after hurricane Katrina. June 21st, 2006 - Interviewed regarding weather warnings & the public. Aug 21st, 2009 - Interviewed regarding Ontario tornado outbreak. May 2013 - Some of my tornado footage was used on Good Morning America national morning show. Morning Live - In-studio on the CTV Ottawa morning show, promoting my April, 2013 talk for the Royal Canadian Geographical Society. News - May 2013 - Phone interview from Tornado Alley. I was a part of a panel of experts on a "Virtual Town Hall" special television program that was produced as part of Earth Action Week. - Interview re: weather prediction - I was a guest on the live streaming news site for the Huffington Post. The topic was weather forecasting, computer models and a little bit of chaos theory thrown into the mix. Some of my volcano footage was used in a new episode of Curiosity that showcases dangerous volcanoes around the world. Some of my Hurricane Sandy footage was used in an episode of Cake Boss, on TLC. I am interviewed as an expert in this 2 hour special on how our bodies contain biological clues to ancient events and evolutionary processes. Oct. 2012 - Phone interview during hurricane Sandy. May. 2013 - Phone interview from Tornado Alley. 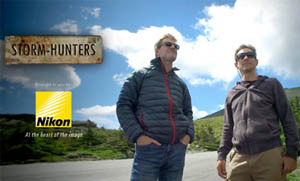 3 new full length half hour episodes of the Stormhunters series on The Weather Network. I was the director of photography and appear on camera with TWN meteorologist Mark Robinson as we document winter weather in 3 parts of Canada. East Coast, West Coast and the Arctic. March, 2012 - I make 2 appearances in this kid's science series: One where I get set on fire to demonstrate my volcano heat suit and another where I report back from a tornado chase. A live, in-studio interview with Nicola Jones on their morning show. June 2014 - In-studio interview on Square Off, re: Angus, Ontario tornado. Intervied in Athens, Greece re: the TEDx Athens event. Here's a link to the recently released video interview I did for the Discovery Channel website. It's called the "Adrenaline Lab". Myself and other adventurers from around the world gathered in New York and we were interviewed by "Man vs. Wild" host and survivalist Bear Grylls. July 11th, 2005 - Call in interview from hurricane Dennis. 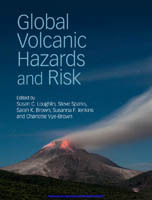 Marum Volcano descent footage used plus interview. Numerous on-location appearances including: Niagara Falls, Indoor skydiving, WINDEE Dome tornado simulator, and even cover in a beard of bees. Global TV News Toronto - News feature on the "Top Ten Event" fundraiser that I spoke at. 10 influential Canadians, each on the stage for 10 minutes, talking about 10 things you need to know before you die. Watch the video here. CBC News Network - Aug 01, 2011 - Connect with Mark Kelley. I filmed a segment called "Ask Me Anything" where I was set up with a table & chairs on a beach and the public was able to sit down and ask me any questions they wished. It was a lot of fun to shoot and the folks asked some great questions. Here's a link to the video. RADX Network - April 2011 - My adventures were featured in an interview segment on the featurette series Big Life, that showcases people that face risk, adventure & danger. World's Worst Weather - Travel Channel - My tornado chasing and volcano climbing adventures are featured in a new 3 part series. Nov 7th 2010. Stormhunters - The Weather Network - I join meteorologist Mark Robinson in his Weather Network series Stormhunters as we document hurricane Earl in Nova Scotia and Hurricane Igor in Bermuda. CBC Morning News - Aug. 21st, 2009 - Live in-studio interview regarding the Ontario tornado outbreak. CBC Newsworld - Oct. 08th, 2009 - Live in-studio interview regarding the Pacific Typhoons & Earthquakes. Angry Planet - Travel Channel - My storm chasing television series is now airing on the Travel Channel in Europe, Asia, Africa, The Middle East & New Zealand. History Channel - On camera interviews and Ethiopia expedition to the Erta Ale volcano was featured in the 2 hour special: "Gates of Hell"
CP24 - LeDrew Live Show - Oct. 15th, 2009 - Live, in studio interview commenting on the Colorado "Balloon Boy" who was thought to have drifted away on an experimental weather balloon. CP24 - LeDrew Live Show - Aug. 28th, 2009 - Live, on location interview from scene of Vaughan Tornado. CP24 - @ Noon Show - Aug. 21st, 2009 - Live, in studio interview commenting on the Ontario tornado outbreak. CP24 - Live Breaking News - Aug. 20th, 2009 - Live, phone-in reports from the scene of the Vaughan Tornado. CP24 - LeDrew Live Show - Aug. 12th, 2009 - Live, in studio interview commenting on lightning strike victims. CP24 - @ Noon Show - Aug. 10th, 2009 - Live, in studio interview commenting on recent storms in Toronto. CP24 - News - Oct. 2012 - Live, in studio interview regarding hurricane Sandy. April 18, 2011 - 3 day tornado outbreak in the U.S.
Aug. 21st. 2009 - City Online - Live in studio interview regarding the Ontario tornado outbreak. CFTO & CTV News Network - Dec 27th, 2006 - News segment on my wedding on top of Yasur Volcano. CTV News Network - Aug. 9th, 2007 - In studio interview re: Weather modification in China. CTV News Network - Nov. 8th, 2008 - Phone in interview regarding hurricane Paloma. CTV News Network - Dec. 13th, 2008 - Phone in interview regarding Northeast U.S. ice storm. CTV News Network & CFTO - Oct. 2012 - In-studio and phone interviews before & during Hurricane Sandy. CTV News Network - Nov. 5th 2012 - In-studio interview regarding nor'easter storm headed for New York. CTV News Network - Dec. 17th 2012 - In-studio interview - My top 3 natuaral disaster threats for 2013. CTV News Network - May 2013 - 4 Live phone interviews from Tornado Alley re: outbreaks. Discovery Channel - Sci-Trek: Volcanoes - Several of my photographs from Krakatau and Nyiragongo volcanoes were used in this documentary TV program. TLC - "Wild Weddings" - May 29th, 2009 - Featuring my wedding on the crater's edge of the erupting Yasur volcano in Vanuatu. Dateline - NBC & MSNBC - A feature on the intercept of Hurricane Gustav in Louisiana. Watch it here. 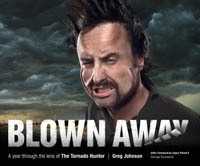 Angry Planet - Weather Channel Australia - My storm chasing television series is now airing on the Weather Channel in Australia as of Jan. 2008. Outdoor Life Network - "Countdown: 25 Worst Outdoor Jobs"
Footage used for Volcanologist & Storm Chaser Segments. 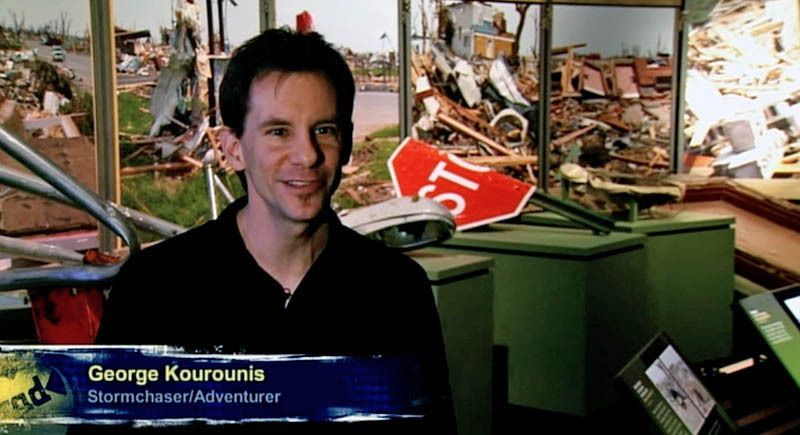 National Geographic Channel- Footage used for "Inside Hurricane Katrina" TV program. July 10th & 11th, 2005 Live interviews via satellite from hurricane Dennis, Pensacola, Florida. msn.com Video Highlights - "Inside A Volcano"
Phone interviews During Hurricane Frances & Jeanne - Sept. 2004. Phone interview for Fox & Friends Morning show - Sept. 2004. Hurricane Frances interview - Sept. 2004. National Geographic Explorer Television 1998 - "Tornado Hunters"
Oct 2018 - Interview for Radiolive 'The Long Lunch"
Sept 2015 - Episode 089: Storm Chasing & Global Exploration. 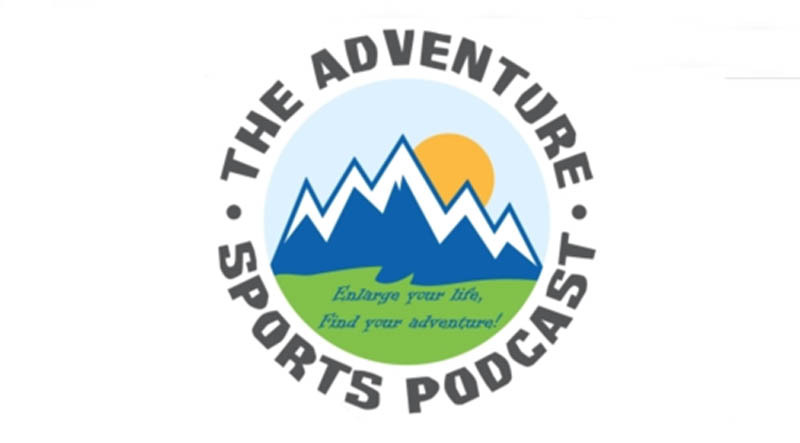 April 2017 - Adventure Sports Podcast - Host, Travis Parsons and I discuss what expeditions I've been up to. May 2018 - We discuss me recent adventures in cluding North Korea and Nepal. April. 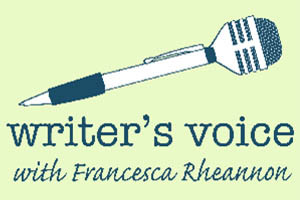 2018 - Writer's Voice show with Francesca Rheannon. A conversation with Rheannon about season four of Angry Planet. Feb. 2018 - Living Full Out radio show with Nancy Solari. Listeners are encouraged to not only embrace change, but to look for opportunities to create it. Don't let life get you down. When your morale starts to dwindle, it's time to get motivated again, make some positive changes, and take each day as an adventure and opportunity to maximize your potential in life. April 2017 - Adventure Science Podcast - I'm honored to be the very first guest on the Adventure Science podcast. Interviewer, Simon Donato is a world class explorer and extreme athlete. He and I worked together on the Madagascar expedition to the Tsingy de Bemaraha..
Jan 2017 - Verbal Shenanigans Podcast - Episode 132. Join in on the fun as we take a bit of a humorous look at my extreme expeditions around the world. Nov 2016 - The MtnMeister podcast presents interviews with todays most extreme, successful, and inspiring people in the world of outdoor sports. June 2016 - The cool guys over at Sickboy podcast had me on as a guest, and it is now available to listen to. It was a LOT of fun, I hope you enjoy it. Sickboy Podcast is hilarious, ridiculously insightful and absolutely determined to break down the stigma associated with illness and disease! The show started with three best friends who recognized that when faced with difficult situations, illnesses and diseases, people tighten up, they get awkward, and they simply don't know what to say. April 2015 - KMBH - "It's Your Health" show. April 2015 - WOCM 98.1 The Ocean - Phone interview during the Rude Awakening morning show. 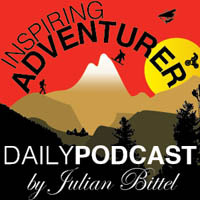 May 2014 - Inspring Adventurer Podcast - I was recently interviewed for the Inspring Adventurer podcast, which is put together by German adventure enthusiast Julian Bittel. He interviews various adventurers, each with a different speciality and finds out more about what inspires us. It was great fun. May 2013 - NewsTalk 91.9 New Brunswick - Phone interview from Tornado Alley for "Maclean in the Morning"
June, 2012 - Phone interview in the Internet Radio show "The Stuph File" with host Peter Anthony Holder. Oct. 2014 - Interview re: volcano descent viral video etc. Jan. 2018 - Interview re: Iceberg climbing, North Korea & more. April 8, 2012 - Phone interview with U.K's Free Radio Network. Sept. 13. 2011 - Phone interview for "Big Picture Science", which is a one hour science show that is produced at the SETI institute's radio studio in Mountainview, California. The entire episode, entitled "Whither the Weather can be found here. The show is carried on the NPR Public Radio Satellite System and is also podcast on iTunes. It was a lot of fun being interviewed by such a prestigious, scientific organization. Aug. 2011 - Phone interview BBC World Service Radio during Hurricane Irene. Oct. 2014 - In-studio interview re: Marum volcano descent & Turkmenistan fiery crater expedition..
Aug. 21st 2009 - Phone interview after the Vaughan tornado. CJAD, Montreal. Sept. 4th 2010 - Phone interview during Hurricane Earl. CJAD, Montreal. Aug. 27th 2011 - Phone interview during Hurricane Irene. Oct. 29th 2012 - Phone interview during Hurricane Sandy. Aug 19th 2007 - 680 News Radio - Phone interview during hurricane Dean. An online article from their website can be found here. April 21st 2010 - Phone-in interview regarding Earth Day. Aug. 21st 2011 - Phone-in interview regarding Toronto storms & Goderich tornado. April. 17st 2019 - Phone-in interview about the upcoming tornado season. Sept. 2nd, 2005 - FM 96, London - Interview with "Tucker & Taz in the Morning"
Aug. 20th & 21st, 2009 - Numerous phone-in reports and interviews regarding the Ontario tornado outbreak. Feb. 27th 2010 - Phone-in commentary on Chile earthquake & Hawaii tsunami warning. July 31st 2011 - Phone interview promoting the "Top 10 Event" in Toronto. July 14th 2010 - Phone interview with CJME NewsTalk Regina re: Saskatchewan storms. April 22nd 2010 - Phone interview with BRMB Radio in the U.K. with host Tim Shaw. Aug. 21st 2009 - Phone interview after the Vaughan tornado. AM 980, London. Aug 2nd 2006 - 570 News Radio Kitchener, ON. Aug 21st 2009 - 570 News Radio Kitchener, ON. - Phone-in interview regarding the Ontario tornado outbreak. May 2014 - Phone interview re: Nebraska tornado encounter. Our vehicle was hit by an irrigation system. Aug 21st 2009 - CJBK News/Talk London, ON - Phone interview after the Vaughan tornado. Aug 2nd 2006 - CJBK News/Talk London, ON - The Shauna Rae Show. July 12th 2010 - CJBK News/Talk London, ON - The Shauna Rae Show. July. 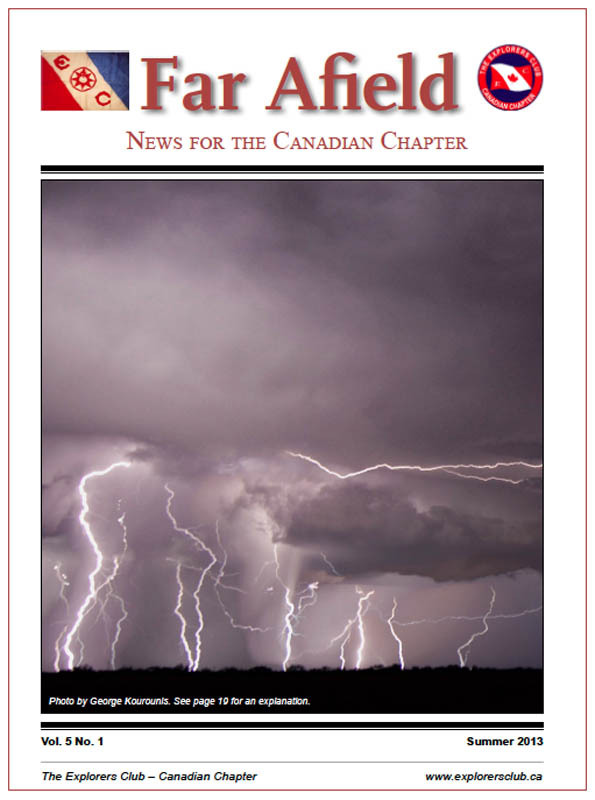 18th, 2013 - CHQR News/Talk Calgary - Phone interview about storm chasing. Sept. 1st, 2009 - CHQR News/Talk Calgary - Live phone interview regarding hurricane Jimena. Aug 19th, 2009 - CHQR News/Talk Calgary - The World Tonight Radio Show. Live phone interview regarding hurricane Bill. Aug 20th, 2007 - CHQR News/Talk Calgary - The World Tonight Radio Show. Live phone interview from hurricane Dean in Jamaica. Aug 1st 2006 - CHQR News/Talk Calgary - The World Tonight Radio Show. July 2nd 2009 - Phone-in interview for the Wawatay Radio Network. Dec 28th 2008 - 9400 News Radio Montreal - Phone interview. June 23rd 2009 - CBC radio Sudbury with host Dan Lessard - Phone interview regarding tornado safety. Oct. 2013 - Metro Morning, Toronto - Live in studio, talking about science education. - Telephone interviews for CFAX 1070 news radio station in Victoria, British Columbia. March 20th 2006 - Nine telephone interviews on the art & science of weather prediction for local CBC radio stations across Canada - Ottawa, Moncton, Sudbury, Gander, Winnipeg, St. John's, Thunder Bay, Windsor & Calgary. Oct. 2005 - Radio Europe Mediterraneo - Telephone interview for the REM FM station in southern Spain. Jan. 10, 2006 - NHCWX Internet Radio - Interviewed on the Severe Weather Central Show. Sept. 2nd, 2005 - 570 News Kitchener - Interview after hurricane Katrina. Sept. 1st, 2005 - "The Ocean" 98.5 - Interview with Mike Forbes on the morning show. Metro Morning with guest host Jane Hawtin on CBC Radio One. Sept. 2004. Metro Morning with Andy Barrie. Sept. 2004. Ontario Today with Allen Neal. June. 14th, 2005. Phone-in reports on the Ontario Tornado warnings. June. 15th, 2005. Phone-in with CBC French radio re: tornadoes. Dec. 15th, 2005. Phone-in, answering questions regarding the winter storm. March 13th, 2006. Phone-in, answering questions regarding the tornado watches. Oct. 201 Metro Morning Phone interview during hurricane Sandy. Phone in report from "Tornado Alley"
June 2nd, 2003 - The Drive@Five with Larry Fedoruk on Newstalk 610 CKTB Niagara. Sept. 2004 - Phone report from Hurricane Frances. May 2013 - 2 Phone interviews from Tornado Alley. - The Afternoon show on CBC Radio Ottawa. Jan 16th, 2002: Special thanks to Mauler & Rush for the radio interview on the "Unknown Morning Show" on 101.1 XFM in Ottawa. 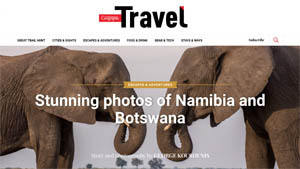 Nov 2018 - Can Geo Travel - A photo essay from my 2018 Africa trip has been published by Canadian Geographic Travel. Click here to check out the article. July 2018 - Cracked.com article. This informative, and very funny article is all about my Darvaza fire-crater expedition. 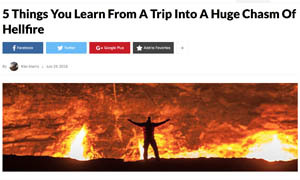 "5 Things You Learn From A Trip into A Huge Chasm Of Hellfire". July 2018 - Frontier - Into The Wild. A profile interview. Frontier is an international non-profit volunteering NGO, with over 400 conservation, community and adventure projects in over 70 countries that give people the chance to make their travel meaningful. 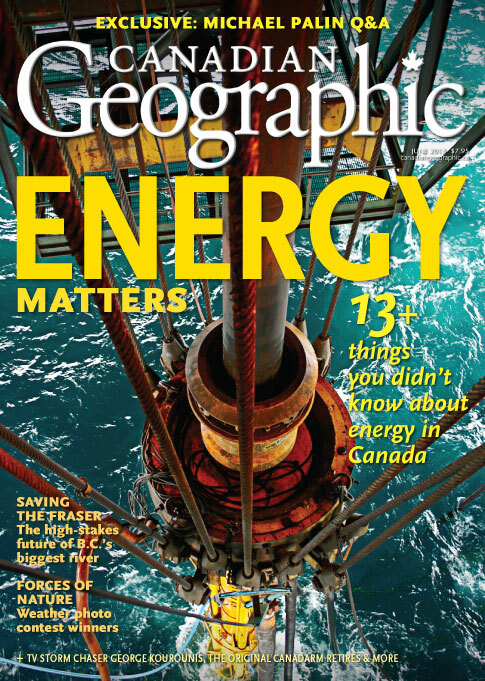 May 2018 - Canadian Geographic profile article on my Guinness World Record for becoming the first person to reach the bottom of the Darvaza gas crater in Turkmenistan. Read the article here. May 2018 - CBC did a profile piece on "lava chasers" including myself, who head towards erupting volcanoes while others flee them. We also discussed the current eruption at Kilauea Volcano in Hawaii. Canadian Geographic has put an interview online that I did with Alexandra Pope, talking about my style of exploration, and my new role as an Explorer in Residence for the Royal Canadian Geographical Society. We also talked about: how I got into what I do, how I manage fear in extreme situations, and also climate change. Jan 11 2018 - George Takei (formerly Sulu on the original Star Trek) has become an internet sensation in the past few year, with his hugely popular Facebook page. He frequently shares pictures and video clips that are seen by millions of people. 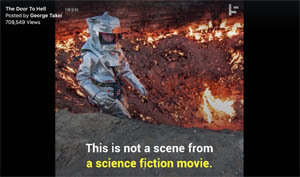 Today, his account sent out a video about the Darvaza flaming gas crater in Turkmenistan. Several pics from my expedition to be the first to the bottom of the crater were featured in the video. Check it out here. National Geographic, Dec 2017 - National Geographic News has released a blog post about "The World's Most Awesomely Awful Places". I was contacted by the author, and several of the places I've explored have been feature in the article. There are truly some incredible places on Earth that few get to see firsthand, and I've been fortunate enough to experience many of them. Canadian Geographic Online - Posted an article about my North Korea expedition & how I carried the flag of the Royal Canadian Geographical Society with me. Outpost has re-published the story of when I set foot on a brand-new volcanic island near Tonga. That was a bizarre experience. 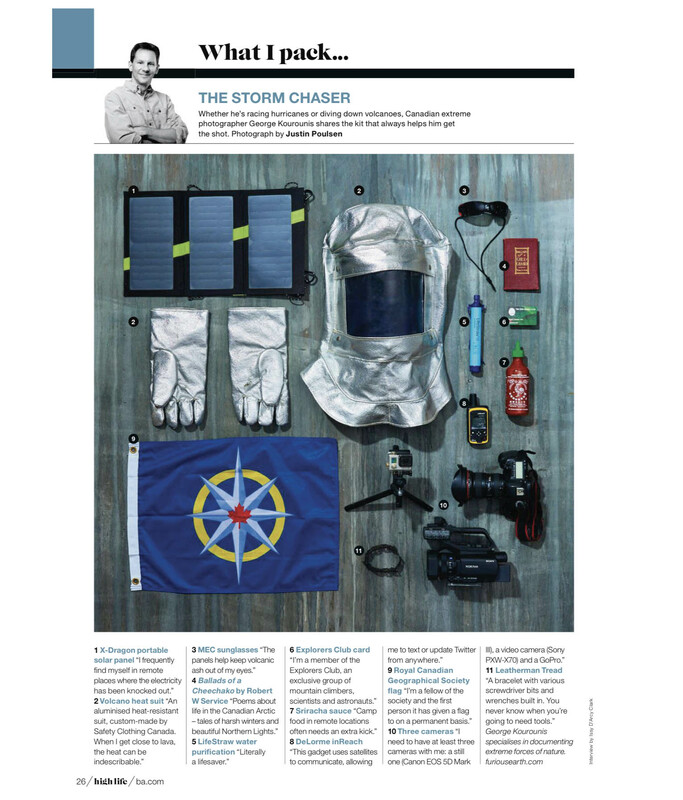 British Airways High Life In-Flight Magazine: The article "What I Pack" showcases many of the interesting and unique items I travel with when I'm jetting around the world, heading towards storms and other natural disasters. View it here. Chicago Tribune: Jan, 2017 - The lifestyle/travel section featured a Q&A with me about my global explorations and adventures: "'Angry Planet' adventurer George Kourounis on his volcano-top wedding and eating snakes." Ellines.com has featuted me as one of their "Famous Greeks." It is an online community for all Greeks. Technically, I'm a Canadian of half-Greek descent, but close enough. 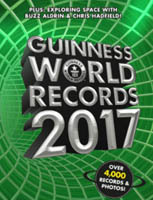 Guinness Book of World Records 2017 - The 2017 edition of the Guinness Book of World Records acknowledges my Darvaza, Turkmenistan expedition with a 2-page spread. The goal of the expedition, which I led for National Geographic was to gather soil samples from the bottom of the world's longest-burning methane crater. Learn more about the flaming gas crater expedition. 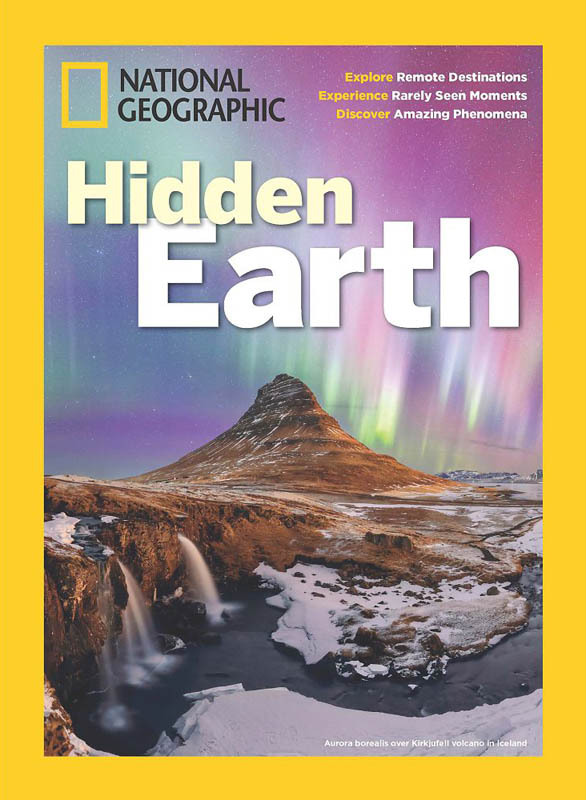 National Geographic: Hidden Earth - My Darvaza flaming gas crater descent expedition in Turkmenistan was given a shout-out in the National Geographic special publication Hidden Earth. "In 2013 National Geographic Explorer and storm chaser George Kourounis was the first person to descend into the searing crater. After about 18 months of training, an expedition team on the ground lowered him - clad in a heat suit and Kevlar harness - into the torrid depths, where he collected soil samples for scientific study. 9 News Australia - A news article about the 2016 Nyiragongo volcano expedition in the Democratic Republic of Congo. Canadian adventurer's journey into 'Hell on Earth'. 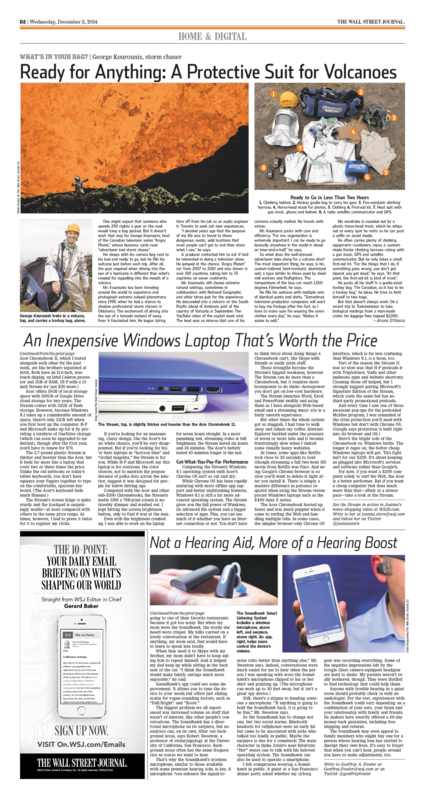 The Mcgill Tribune - A feature article in the McGill University newspaper. Man vs. Storm: A Conversation with George Kourounis. 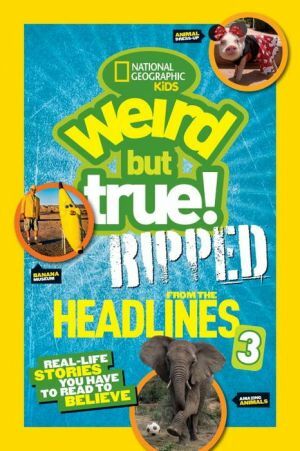 National Geographic Kids - The "Weird But True, Ripped from The Headlines 3" book has a two-page photo spread featuring one of my trips down inside Ambrym Volcano. 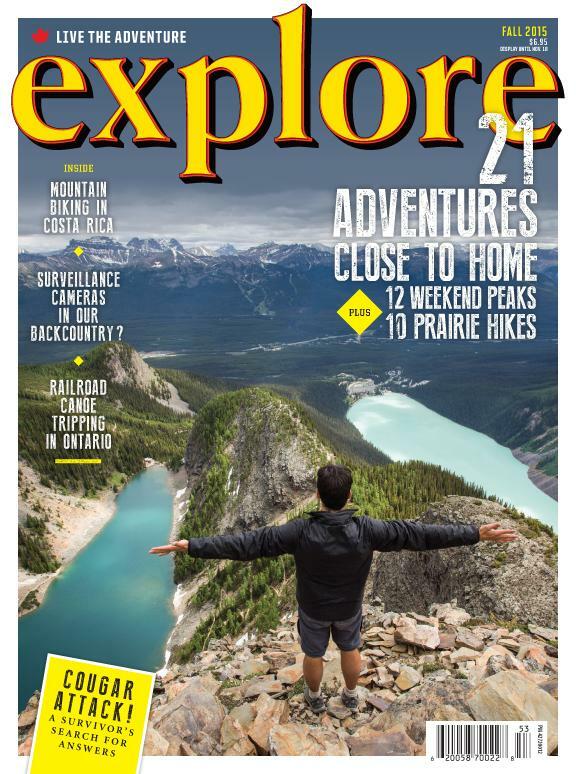 Explore Magazine - Fall 2015 - I was a contributor to Explore Magazine's article on "Canada's Best Micro-Adventures". My contribution to the curated section of the article was the Warsaw Caves Conservation Area, near Toronto. 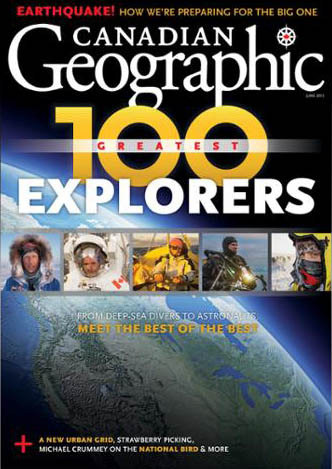 It is a serious honour to be named by Canadian Geographic magazine to be among Canada's top 100 explorers. It is quite the list, with many friends, colleagues and expedition partners listed as well. It's surreal to end up on a list that includes: James Cameron, Chris Hadfield, Elon Musk, Les Stroud and David Suzuki. 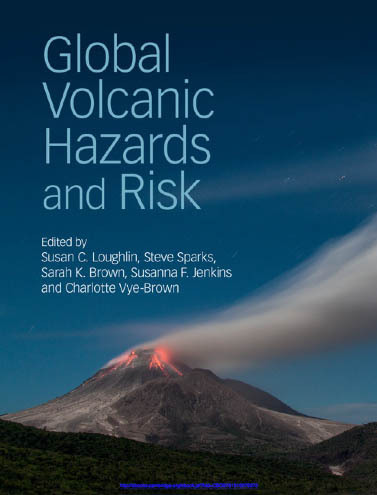 Global Volcanic Hazards and Risks - Some of my volcano imagery appear in this new book. Men's Journal - April 2015. Journalist Mark Adams was embedded with us during the Madagascar Limestone Labyrinth expedition and wrote an excellent article about his experience as we explored deep into the Tsingy de Bemaraha and made some amazing discoveries including a brand new cave, never mapped before. Read the full article here: The Devil's Obstacle Course. Scribol.com - April 2015. A feature article on my descent into the Darvaza flming gas crater in Turkmenistan. 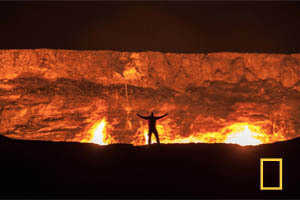 "The First Man to Descend into Turkmenistans Door to Hell"
Mother Nature Network - A Q&A interview about my global adventures and the new season of Angry Planet coming up on Pivot TV. Paste Magazine.com - A Q&A Travel feature, asking me about my adventures, what I like to bring with me when I travel, and where I'd like to go next. 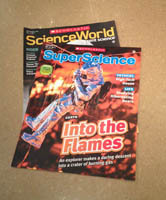 A profile of my Darvaza, Turkmenistan expedition with National Geographic is featured in the latest editions of ScienceWorld & SuperScience magazines. Published by Scholastic, these magazines are distributed in schools across North America. I was featured in the Wall Street Journal newspaper in an article that showcases what certain people carry in their bag when they travel. The "What's in your bag" story concentrated on what I bring with me when I go to visit an active volcano. Dec 2014. It was great fun, especially the photo shoot. 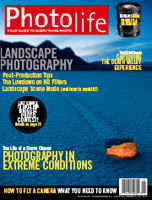 Photolife Magazine - A seven page question & answer feature article on photography in extreme conditions. Oct/Nov 2014 issue. Also reproduced in the french language version Photosolution. The very popular website Cracked.com has just released an interview article the did with me recently, entitled "6 Survival Tips From A Professional Adventurer". It is a hilarious article, and it was so much fun working with the writer. Check it out, I was laughing out loud when I read it. National Geographic Online - July 2014 - Several features on my expedition into the Darvaza flaming gas Crater in Turkmenistan desert. The Daily Mail UK - May, 2014 - Article about our tornado encounter where a farmer's irrigation system hit our vehicle. The Telegraph UK - May, 2014 - Article about our tornado encounter where a farmer's irrigation system hit our vehicle. Global News Online - April 25, 2016 - A look back on the 30th anniversary of the Chernobyl nuclear reactor accident & my toughts on having visted the radioactive bexclusion zone. Global News Blog - April 28, 2014 - Interviewed regarding the Arkansas tornadoes & storm chaser safety. 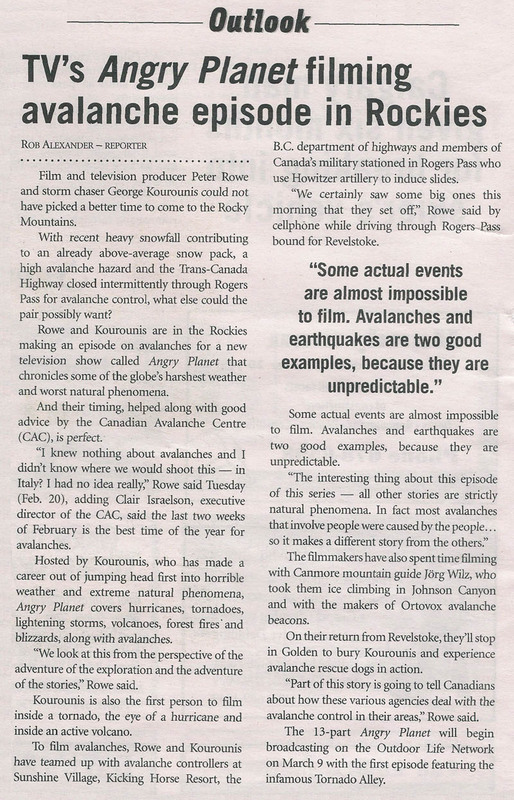 Metro - An article on my storm chasing was featured in the cross-canada daily Metro Newspaper, July 18th, 2013. One of my photos has been chosen to grace the cover of the latest issue of Far Afield, the news bulletin for the Canadian chapter of the Explorers Club. The photo is of a Texas lightning storm I photographed during my recent storm chasing trip to the central U.S.
Canadian Geographic Magazine - A question and answer article that I did appears in the June, 2013 issue of the magazine. In addition, on May 28th I did a LIVE Twitter interview with Can Geo while out in the field on my annual storm chase trip. As I was doing the interview, there was a tornado on the ground, near Bennington, Kansas! The Goddess Of The Hunt - An online Greek creative collective did a feature article on me and my adventures around the world. Australian News - May 2013 - One of my interviews from Tornado Alley was used by several news outlets in Australia. May 16, 2013 - AOL featured one of my lightning pictures in their "10 Must-See Photos"
May 2013 - Canadian Geographic Magazine - Thank you Canadian Geographic Magazine for inviting me to write the intro for their 2013 "Wicked Weather" special collector's edition issue. The photos inside are stunning and all of them have been submitted by readers across the country. We certainly have all types of weather in this vastly diverse nation of ours. Find it on news stands now. 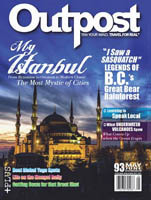 May 2013 - Outpost Magazine - The new issue of Outpost Magazine features an article that I wrote that talks about my expedition to a brand new island off the coast of Tonga that we visited while filming an episode of Angry Planet a few years ago. We almost didn't make it due to rough seas, mechanical problems and, well, the list goes on and on. We eventually had to swim to shore. 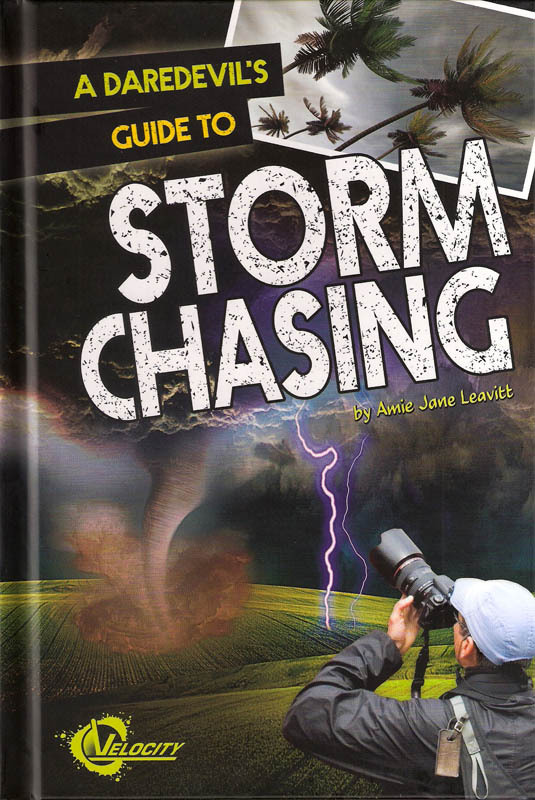 Jan. 2013 - A Daredevil's Guide to Storm Chasing - Several of my photos are featured in a new kid's book that showcases all different aspects of what storm chasing is like. Photos of my storm chases shown in the book include: Hurricane Igor in Bermuda, and tornado chases in Texas and South Dakota. Dec. 2012 - Eco Traveller digital magazine - Features a 4 page Q & A interview I did with them about my adventures, travel, and the environment. Find it online here. 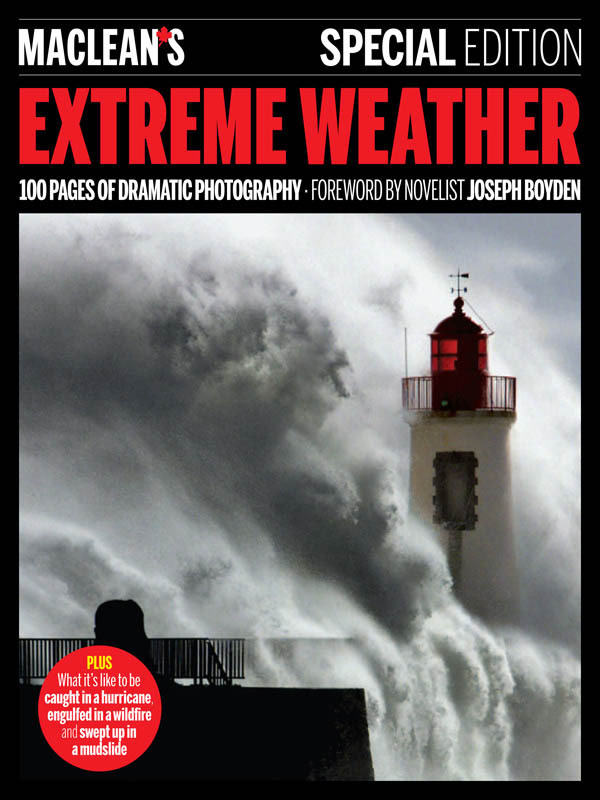 Nov. 2012 - Maclean's Magazine - Extreme Weather Special Edition - Maclean's Magazine just released a special edition all about extreme weather and I make a few appearances in it. There is a 2-page photo of me at Peggy's Cove, Nova Scotia, during Hurricane Noel, taken just as a huge rogue wave came crashing over the rocks and came slamming down on top of me and my truck. It's never a good thing when you have to look straight up to see the wave that's about to smack you!. The shot (you can see it here) was taken by my good friend, National Geographic photographer Mike Theiss. I'm also interviewed in the magazine about my experience with a sand storm in the fabled city of Timbuktu, on the edge of the Sahara Desert. 1Q9A is made up of over 90 different professional categories, each hosted by a panel of 9 experts. As a visitor to 1Q9A, you are invited to submit your questions to any of these expert groups. Once a week, our editors select just one question per category that we think will produce some really varied and interesting responses. 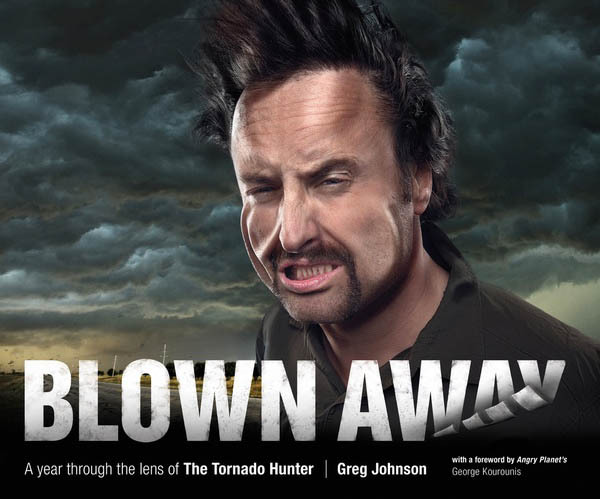 April 01 2012 - Blown Away, a year through the lens of the Tornado Hunter - Friend and fellow Canadian storm chaser Greg Johnson from Regina, Saskatchewan has released a new book about his experiences during the 2011 tornado season. I wrote the foreword for this book and I highly recommend it. Greg's photography is outstanding. March 2012 - Photos from my traverse of the Boiling Lake on the island of Dominica have made their way onto the very funny website Cracked.com. The article is entitled The 5 Most Spectacular Landscapes on Earth (That Murder You). There is a certain amount of truth to this title. It is a spectacular place, but it is also very dangerous and a lot of caution needs to be exercised there. Dec. 2011 - "7 Days: Manifesting the Life You Want" - I'm given several mentions in this new book by my friend Freda Chaney. 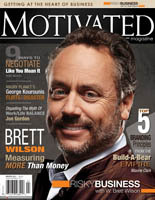 Dec 01, 2011 - Motivated Magazine has featured a five page article that I wrote for them. The article is called "Flirting with Disaster" and includes some crazy stories as well as tips for overcoming fear. My adventure at the Kawah Ijen volcano in Indonesia has made the pages of the "Ripley's Believe it or Not - Special Edition 2012" book. The trip where I took an inflatable rubber raft out onto the world's largest lake of sulfuric acid is given an entire page with photos and an interview. This is the second time that I've been featured in a Ripley's book... Believe it, or not! 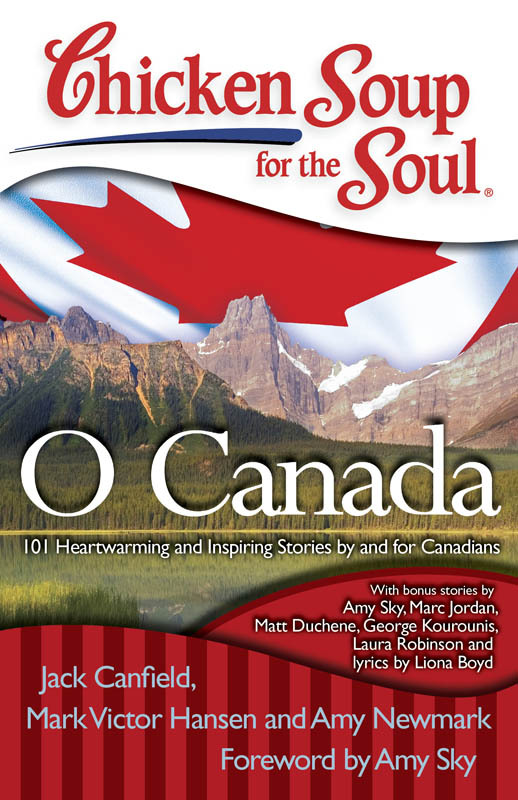 Just Released - I was invited to be a contributing writer for the new book "Chicken Soup For The Soul O Canada". The mega popular "Chicken Soup" series has sold millions of copies worldwide and it was a great honor to be asked to submit a story for this brand new book. This edition is a compendium of 101 heartwarming and inspirational stories by and for Canadians. 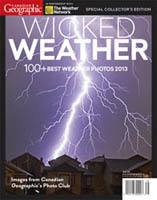 My contribution is about how Canadians handle their extremes of weather and how I got my start chasing storms. Other contributors include: Amy Sky, Marc Jordan, Matt Duschene, Laura Robinson and Liona Boyd. Aug 7th 2011 - The Discovery Channel "Curiosity Project" features an image from my expedition to the Naica Crystal Cave in Mexico. The cave is in the "10 amazing geological features"
Aug 4th 2011 - The Grid- Toronto newspaper, The Grid did an interview with me regarding the "Top Ten Event" fundraiser that I was speaking at. Read the article here. July 8, 2007 - The Toronto Star Online Newspaper - Featured an online slideshow & phone interview from Dominica following my Boiling Lake Traverse. See it Here. Aug 1, 2011 - The Toronto Star Newspaper - Featured article on the front page of the Entertainment section, in conjunction with the Top 10 Event. Read the article here. Oct 1, 2016 - Featured in an article about volcano tourism. July 22nd 2011 - BBC 2 - The BBC invited me to be a guest contibuting blogger on the website for their environmental program "23 Degrees" Here is the blog post I wrote for them. June 2011 - Icon Magazine - I'm featured in an article in the Greek Icon magazine. 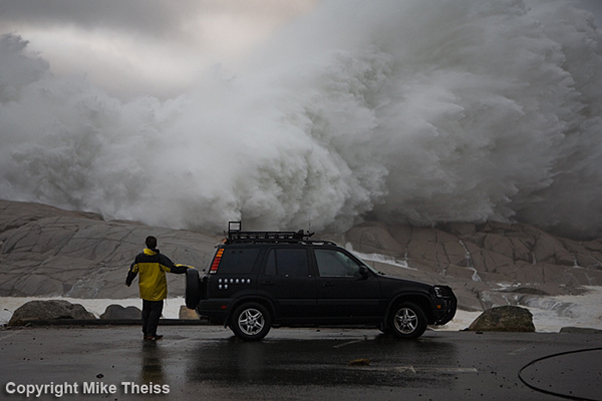 June 04 2011 - National Geographic News website - The front page features a photo by photographer Mike Theiss showing me about to get pounded by a huge wave at Peggy's Cove, Nova Scotia during hurricane Noel. Canada.com Newswire Service - Print & online artice about chasing hurricane Earl - Distributed to newspapers across Canada including the above. Ripley's Believe It Or Not - My adventure of rafting out onto the acid lake at the Kawah Ijen volcano in Indonesia has been featured in the latest Ripley's Believe It Or Not book. July, 2010 - Crush The Test - Cover Photo. One of my Komodo Dragon photographs is on the cover of a new SAT math test preparation book written by Matthew Kohler Ph.D.
July, 2010 - American Lifestyle Magazine - An 8 page interview with numerous photos is featured in the July/August issue. Read it HERE. 2010 - Time for Kids (U.S. & Japan) - A time Magazine publication. Caving photos used. 2010 - Photo from the Yukon Territory used in an article. March 30, 2010 - I interviewed Geoff Green, founder of Students on Ice, for Discovery News. Read the interview here. March 2010 - FHM Magazine, India - Features a 4 page interview discussing storm chasing, common sense and nature. Read the article here. Jan. 2010 - Photos from my exploration of the Naica Crystal Cave have been showcased on Discovery Channel's news page. See the photos here. Sept. 09-11, 2009 - Spaceweather.com - Front page feature on my expedition to the Naica Crystal Cave - "Inner Space Terranauts"
Aug. 24, 2009 - Metro News Toronto, newspaper - "Odd Jobs" feature article. Sept. 14, 2004 - Metro News Toronto, newspaper article. Feb. 2009 - Odyssey Magazine - Several of my photographs featuring the sinking of Venice were used in an article about the MOSE construction project. Sept. 2008 - The Washington Post Newspaper - Quoted in an article regarding being in the eye of hurricane Ike in Galveston, Texas. 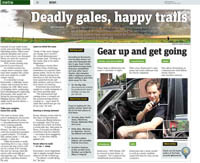 June 30, 2007 - The Globe & Mail Newspaper - Feature article on my storm chasing and weather in Southern Ontario. Read it Here. March 2007 - Weatherwise Magazine - The front cover features a photo from the September forest fires in Northern Ontario. Feb. 2007 - The Epoch Times - Featured and article on Angry Planet. - March 03, 2007 - Featured an article on Angry Planet in the Starweek TV listings insert. 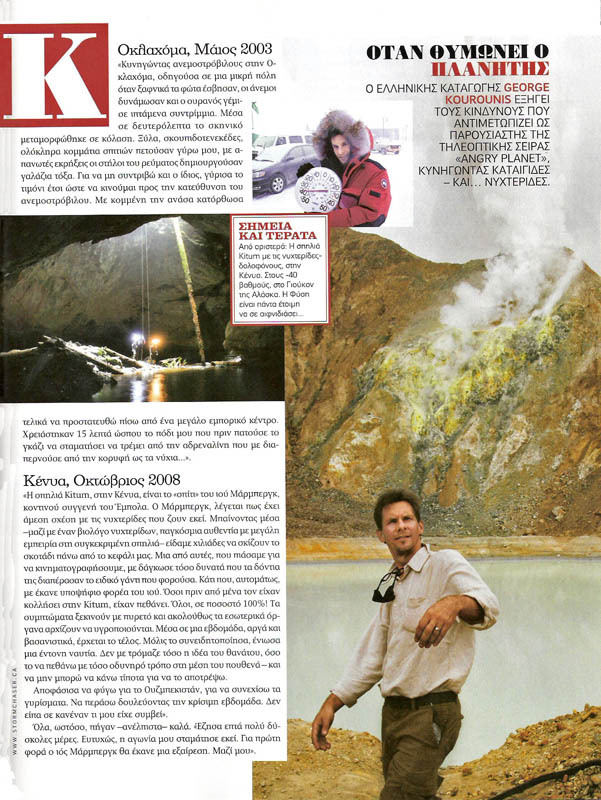 - Jan. 29, 2005 - Article featuring the Erta-Ale volcano expedition. - Sept. 01, 2004 - Newspaper article featuring myself and fellow chaser, Mark Robinson. March 2007 - My exploits filming Angry Planet were featured. 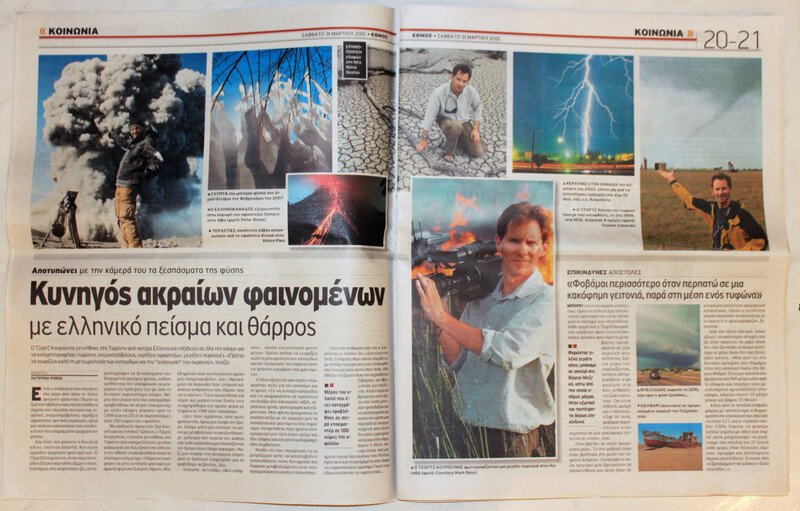 April 2005 - My Tornado/Hurricane/Volcano chasing adventures are featured in a full page feature article in this month's issue of Explore Magazine. Feb. 2007 - The Rocky Mountain Outlook. Sept 18 2006 - CNN.com - One of my forest fire photos was featured as a spotlight picture on CNN's website. Aug 2005 - Flak Magazine - Photo used for storm article. July 2005 - St. Petersburg Times - Newspaper article on hurricane chasers. Nov. 26, 2004 - Ottawa Citizen, newspaper article. June 5th, 2005 - Large feature article. May. 29, 2005 - Canada.com - Online article on the 20th anniversary of the Barrie, Ont. F4 Tornado. May. 29, 2005 - Canoe Network CNEWS Online - Quoted in article on the 20th anniversary of the Barrie, Ont. F4 Tornado. Feb. 14, 2005 - Telephony Online Internet article on my satellite communications use in Ethiopia. Jan. 22, 2005 - National Post newspaper article featuring Ethiopian volcano Expedition. July 11, 2005 - Newspaper article featuring my hurricane Dennis chase. Jan. 21, 2005 - www.canadait.com - Online interview on satellite communications and other technology used on the Erta Ale Volcano Expedition. 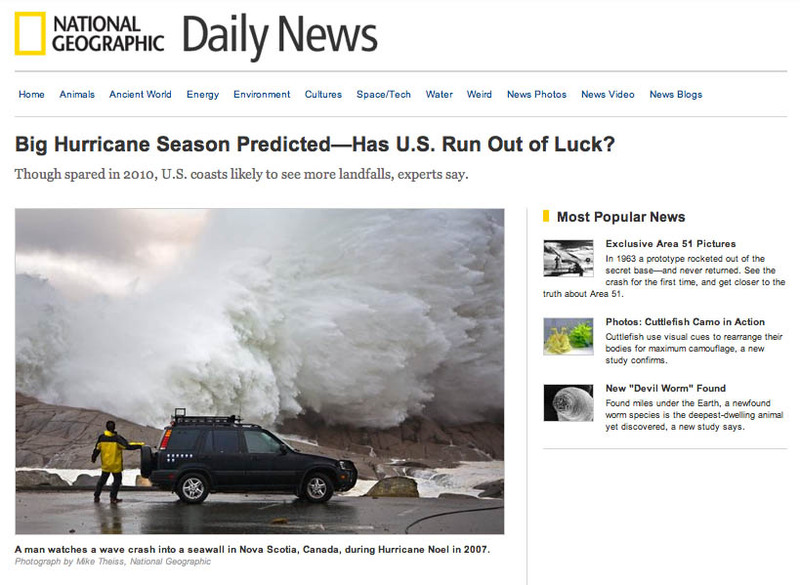 Sept. 2004 - Yahoo News - Picture and caption of Hurricane Frances used by Yahoo News provided by Reuters news agency . May. 29, 2005 - Online article on the 20th anniversary of the Barrie, Ont. F4 Tornado. Aug. 2004 - Automotive magazine: The Driver - Features an article on storm chasing and my chase vehicle. Spring 2004 issue of Rev Magazine - 4 page article with interview and photos. Weather picture of the day.com featured some of my images as their "Picture of the Day" In addition to the website, they also have a service where they will email you the weather picture of the day.